SAN FRANCISCO, Sept. 12 (Xinhua) -- China's efforts to combat climate change have yielded fruitful results and its leadership will be vital in the future as countries join hands to tackle the urgent problem, government officials and industry leaders said on Wednesday. "China's leadership has been truly outstanding. I want to repeat the gratitude people around the world feel for China," said Al Gore, former vice president of the United States, at the China Pavilion during the ongoing Global Climate Action Summit here. According to Bloomberg New Energy Finance, China's investment in clean energy stood at 132.6 billion U.S. dollars in 2017, accounting for nearly 40 percent of the global total. 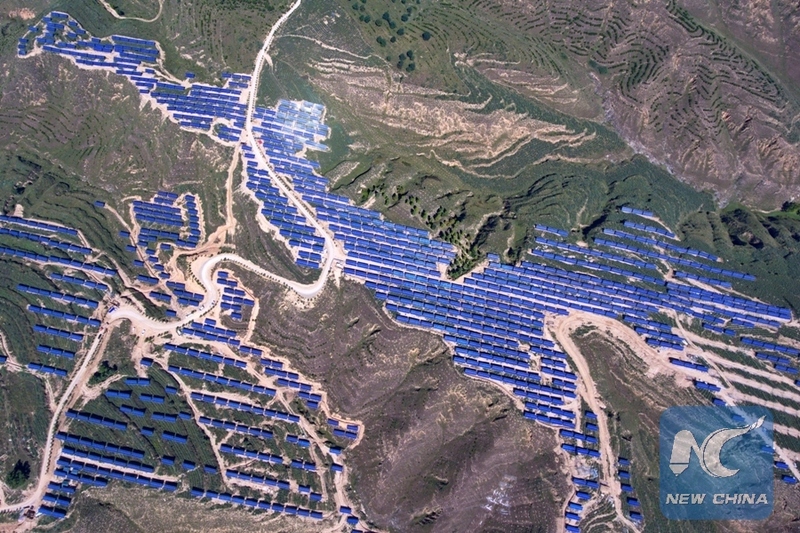 Meanwhile, Chinese companies accounted for around 60 percent of total annual solar cell manufacturing capacity globally last year, data from the International Energy Agency showed. Nicholas Stern, chair of Grantham Research Institute on Climate Change and the Environment at London School of Economics and Political Science, said that China should be in the leading position to enhance actions on climate change. Stern said infrastructure will double in the next 15 years, the world economy will double in about 20 to 25 years, and the population of the cities will double in the next 40 years. In the meantime, greenhouse gas emissions have to be cut by at least 30 percent in the next two decades. "It couldn't be simpler in the sense that we have to find the new growth story," said Stern, and this is exactly where China's leadership should come in. Stern showed the audience a graph of China's emission in the 21st century, which, with ups and downs, indicates a development path. "China is not only acting itself, it's carrying very powerful messages for development around the world," he said. He added that through the "extremely important and positive" Belt and Road Initiative (BRI), China will be able to show roughly half of the world's population that achieving growth does not necessarily result in damage to the climate. China Pavilion is a three-day affiliated event series during the 2018 Global Climate Action Summit that brings together government officials of China and the United States, businesses, and organizations to share their climate progress and to advance international cooperation. China and the state of California have a longstanding, successful partnership on climate and clean energy. Keynote speakers at the event pointed out the importance for the two sides to enhance cooperation and lead global efforts. California, whose economy ranks the fifth in the world, has set a goal to mandate carbon-free electricity by 2045 under legislation signed Monday by Governor Jerry Brown. In the meantime, the southern Chinese city of Shenzhen's experience of simultaneously achieving air quality and carbon emission goals was shared and praised during panel discussions. A metropolis and major manufacturing hub developed from a fishing village 40 years ago, Shenzhen plans to peak the city's carbon emissions by 2022. Eric Heitz, CEO and co-founder of Energy Foundation, said these stories about prosperous low carbon development will be the "main course" of the 21st century. "It is just great to see this cooperation here today between California and China, and to watch innovations by each actor, and to see how these policies can move rapidly around the world," said Heitz. About 4,500 delegates from city and regional governments, as well as industries and research institutions, attended the Global Climate Action Summit that opened on Wednesday. The three-day gathering will be a launchpad for deeper worldwide commitments and accelerated action by countries that can put the globe on track to prevent dangerous climate change and realize the historic Paris Agreement.